Note: Red triangles on the map represent towns where rebel group Jabhat Fateh al-Sham (JFS), formerly known as Al Qaeda affiliate Jabhat al-Nusra (a.k.a. the Nusra Front), is thought to be in a dominant position among rebel forces, even if it doesn't exercise exclusive control. This organization has some presence in almost every rebel-held area in Syria. The following is a timeline of changes to territorial control and other key events in Syria since our previous map update of October 23, 2016. Sources are provided in the form of links. The race for control of IS-held Al-Bab continued as Turkish-backed Free Syrian Army (FSA) rebels seized three villages from the group north of the town, while the Kurdish-led SDF captured four villages from the rebels (two west and two east of Al-Bab). With the advances, the rebels were 13 kilometers from Al-Bab, while the SDF was positioned at a distance of18 kilometers.. The Syrian Army recaptured the town of Suran, north of Hama, which it had lost to rebels at the end of August. Meanwhile, northeast of Aleppo, the race to the IS-held town of Al-Bab continued. The Kurdish-led SDF captured several villages from the Turkish-backed rebels, while the rebels themselves took control of several villages from IS. The SDF and the Syrian Army jointly seized half a dozen villages from IS, northeast of Aleppo, and a former Infantry College came under the control of the army. Elsewhere, the army surrounded the rebel-held town of Khan al-Shih, southwest of Damascus. Rebels launched an offensive on the government-held western part of Aleppo city in an attempt to break the siege of the rebel-held eastern section. In the first two days of the operation, they managed to capture the Minyan Sawmills, most of the Dahiyat al-Assad district and half of the Minyan district. During this period, 12 suicide bombers were used against government positions. On November 3, the rebels launched the second phase of their offensive, attacking the New Aleppo district, but the assault was ultimately repelled. At this point, the rebel offensive slowed and on November 6, government forces launched a counter-attack in the southwest of the city. 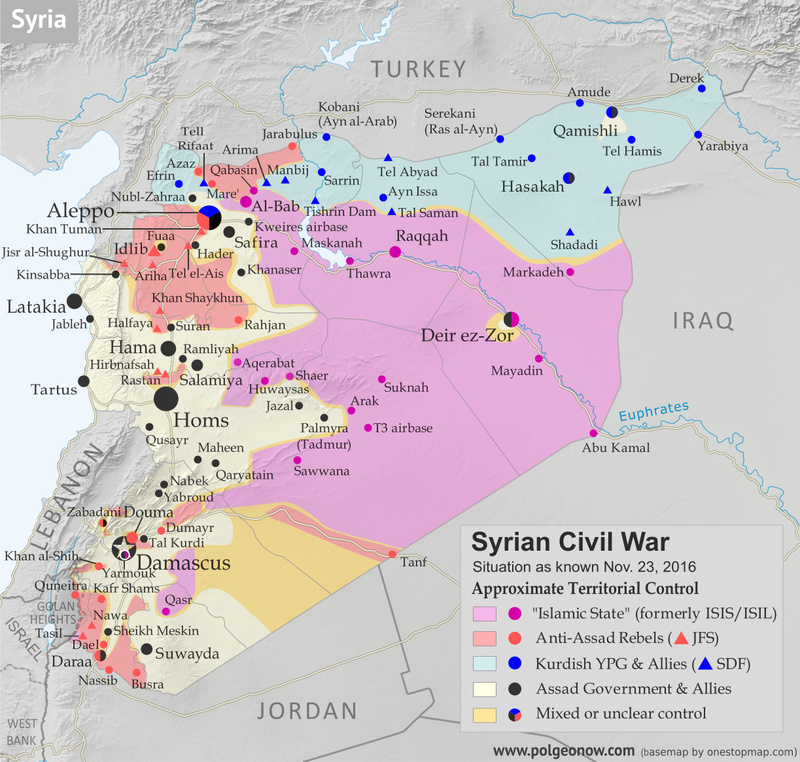 By November 12, pro-government troops had managed to reverse all rebel gains and additionally retake territory they had lost in the rebels' summer offensive. Between October 28 and November 11, 291 rebels and 146 pro-government fighters were killed in the offensive, along with 96-127 civilians who died due to rebel shelling. An additional 350-400 rebels and 200-300 pro-government fighters were wounded. Pro-rebel media also reported nearly 500 civilian deaths from government shelling in eastern Aleppo. The army captured Tal Kurdi, as well as one other nearby town, east of Damascus, further shrinking the rebel pocket known as Eastern Ghouta and coming closer to the rebel stronghold of Douma. IS managed to recapture 17 villages from the Turkish-backed rebels northeast of Aleppo. The army captured a village near the town of Khan al-Shih. Thirty-three rebels were reported killed in the area the previous day. A rebel assault north of Hama resulted in the capture of several positions. However, an army counter-attack subsequently regained all lost territory. The Turkish-backed rebels captured 36 villages from IS north of Al-Bab, advancing to within two kilometers of the town. On November 14, the rebels managed to enter the northern outskirts of Al-Bab, but were forced to withdraw one kilometer to the north of the town the next day. Concurrently, between November 11 and 15, the SDF captured 15 villages east of Al-Bab from IS, besieging the town of Arima. On November 6, the SDF announced the start of the offensive to reach the IS capital of Raqqah. Within 15 days, they managed to seize 48 villages and farms from IS, including the strategic hilltop village of Tal Saman, 26 kilometers north of Raqqah. Following these advances, the SDF said Phase One of their offensive (cutting of Raqqah from its northern countryside) had been completed. The aim of Phase Two was to enforce a full blockade of the city. By November 22, the SDF was 20 kilometers north of Raqqah. At this point, the SDF threatened to halt the offensive if the US-led coalition did not force Turkey to halt attacks on SDF forces in the Manbij area. The previous day, Turkish-backed rebels attacked and temporarily captured a village northeast of Al-Bab from the SDF, before the Kurdish-led forces managed to retake it. The Syrian Army took control of a strategic road southwest of Damascus, tightening the siege of Khan al-Shih. Over the next five days, the town was hit with more than 140 barrel bombs and ground-to-ground missiles. Government forces captured two villages south of Aleppo. A new Syrian-Russian offensive on the rebel-held eastern part of Aleppo city was announced with heavy Russian airstrikes. By November 22, the military managed to seize a strategic hill overlooking the rebel-held Hanano district, half of Hanano itself, and 75 percent of the central Bustan al-Basha district. Reports said 159 civilians had been killed in the first seven days of the offensive. Of these, 143 died due to pro-government shelling and airstrikes, while 16 were killed by rebel shelling. On November 15, rebels attacked the IS-held town of Qabasin, northeast of Al-Bab, and over the next eight days the town changed hands six times, ending up under IS control at press time. The army managed to seize two areas west and east of Khan al-Shih before a surrender agreement was reached for the town's rebel administration. Under the agreement, after a two-day ceasefire, 1,000 rebels would be evacuated to Idlib province and the town would be surrendered to the military. The Assad government rejected a UN proposal to halt the fighting in Aleppo by granting the eastern half of the city autonomous status, which would have allowed the Syrian opposition to continue administering the area after a drawdown of rebel armed forces. The head of Iran's veterans' affairs office confirmed more than 1,000 fighters sent from Iran to Syria have been killed since the start of the war. The number includes Iranian soldiers, as well as Afghan and Pakistani militiamen. The Turkish-backed rebels captured three villages from the SDF and two from IS west and east of Al-Bab, while the SDF managed to seize the town of Arima from IS. In addition, the SDF took control of a village from IS west of Al-Bab. Elsewhere, the Syrian Army launched an assault on a rebel-held mountainous area in Latakia province and managed to capture several positions before ultimately being repelled, with the rebels recapturing most of their lost territory. Meanwhile, it was reported that rebels in eastern Aleppo were preventing about 100 families, totaling 250 civilians, from crossing from the rebel-held part of the city into the Kurdish-held northern district to escape the government offensive.